You have reached the premier physical therapy and sports medicine facility in Huntersville, North Carolina. We serve all athletes, from professionals to weekend warriors. Our specialized staff can get you back to competing at the high level you expect. Our team of physical therapists and athletic trainers are available to provide rehabilitation services specializing in orthopaedic and sport specific therapy. Aquatic therapy offers a challenging yet gentle medium to allow for lower gravity forces on joints that is appropriate for most patients and diagnoses. 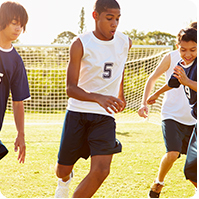 Lakeside Physical Therapy & Sports Medicine is proud to provide medical coverage for local high school and community events.